AMBASSADOR Andrew Young, one of the men that played a pivotal role in the implementation of United Nations Resolution 435 and the eventual independence of the country from colonial rule, is on special visit to Namibia. Ambassador Young is leading a delegation of about 50 professionals from across the United States of America on a tour of four southern African countries. The group made their first stop in Swakopmund after arriving in Namibia. Next on the delegation’s schedule was the head office of the Namibian Ports Authority where the Chief Executive Officer, Mr. Bisey /Uirab, presented the plans of Walvis Bay’s ambition to become the logistics hub of choice for Namibia and its landlocked neighbours. Mr. /Uirab told the delegation that Namport is in advanced negotiations with the Port of South Jersey to sign a Memorandum of Understanding that would drastically improve trade between the eastern seaboard of the US and the Southern African Development Community. “As a logistics hub Namport has a lot to offer in terms of capacity, efficiency and connectivity. We are the doorway that would give markets in the US access to nearly 300 million people living in the southern African region. Namibian systems are efficient and everything works. Namibia is ready to trade with the world through its main harbour,” /Uirab said. The visit by Ambassador Young and his delegation is coordinated by the Andrew J. Young Foundation and has as its aim to prompt deliberations and collaboration between various institutions in the US and African governments as well as private entities. The Andrew Young Foundation builds on the Ambassador’s legacy by developing and nurturing new generations of innovative leaders to tackle this era’s global challenges. During his address to the meeting at Namport, Ambassador Young said Africa is a continent of opportunity and that he has made it one of his major focuses since leaving public office over two decades ago. “The agreement to broker peace between SWAPO and the former South African regime which eventually led to the implementation of UN Resolution 435 and Namibia’s Independence was signed in my hotel room at the Waldorf Astoria,” he said. Ambassador Young said he started his work in Africa with Namibia and ever since then had a very special bond with the country and its people. With regards to the business of harbours he used the Atlanta International Airport and the Port of Savannah in Georgia as an example of what can be done with the development of infrastructure to aid the people of a country to alleviate poverty and create jobs. Young led the successful effort to bring the Centennial Olympic Games to Atlanta in 1996. As Co-Chair of the Atlanta Committee for the Olympic Games, he oversaw the largest Olympic Games in history in terms of numbers of participating countries, competing athletes and the number of spectators. The development of the Atlanta International Airport played a pivotal role in the state of Georgia lifting itself free from an economic recession about a decade earlier. His tenure as Mayor of Atlanta in the early 1980’s corresponded with a recession and a reduction in federal funds for cities. He turned to international markets for investments in Atlanta, attracting 1 100 new businesses, $70 billion in investment, and 1 million new jobs in the region. Ambassador Young said it is with this knowledge and experience that he comes to the African continent not to instruct people on what to do but to show them the way to economic freedom by solving problems without paying too much for the effort. He said the development of the new container terminal and oil terminal in the port of Walvis Bay is a step in the right direction. “Namibia’s plan to position itself as a logistic hub for southern Africa and countries beyond is an excellent strategy because the continent will be the primary world market of the near future. Ambassador Young and his delegation will also visit with President Hage Geingob in Windhoek during a courtesy call on Wednesday. 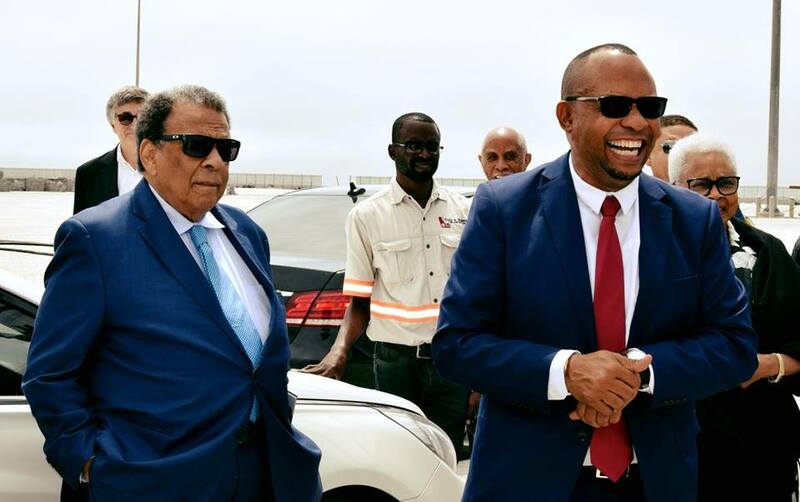 Pictured: Ambassador Andrew Young and Namport CEO, Bisy /Uirab share a lighter moment during a site visit to the new container terminal development in Walvis Bay.